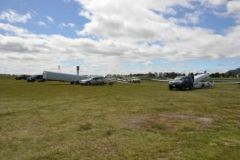 11:00 - Gliders are gridding & we will re-brief for a task at 12:00. There is a high pressure ridge over the Tasman & the top of the north island which is expected to pull in quite a bit of moist air this afternoon & tommorrow. Winds should be South Westerly. Unfortunately theres a bit of contradiction in the weather information today but cloud base should hopefully be around 5000' today with sea breezes expected in the North and East. 19:15 - Well, the expected over development didnt happen and the day ended up blue towards the second turnpoint around Waipunga for the open class. This caught out a few of the field with some landing out & others failing to have enough left in the day to complete the final turn point. Overall, the day was quite tricky as lift cycled quite quickly with promising looking clouds not looking quite so nice when you arrived under them. 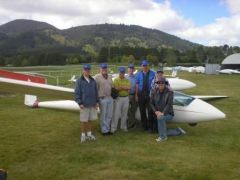 However, some really good soaring was also available and three pilots completed the open course and one the club course. The BBQ and prize giving is about to start & results will be posted straight after. Written on 6 November 2009 at 22:59. Written on 5 November 2009 at 21:47. 11:00 The front that was approaching yesterday has slowed down and is on top of us now. Prospects for soaring this afternoon look extremely thin so the day has been cancelled. Written on 4 November 2009 at 23:10. Written on 3 November 2009 at 23:35. Written on 2 November 2009 at 23:17. Written on 1 November 2009 at 23:32. Sunday 13:00 Last minute hiccups with the club internet made the scorers life harder. Looks like things are under control now. Tasks are distributed & gliders gridded. Waiting on a 13:30 Launch. Weather still looks a little blue out of the club house window but the sun is warm and there are signs of convection appearing. Written on 1 November 2009 at 00:59. Written on 31 October 2009 at 02:57. Every year, a favourite club challenge is to "Fly Round the Lake". 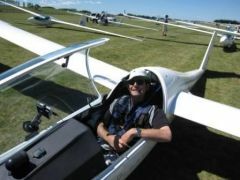 This task usually involves taking advantage of the lake breeze convergence, but for the truly adventurous can include a side excursion north to Kawerau and Opotiki, or south to the Crater Lake on Ruapehu. For more pictures have a look in the Gallery. Written on 16 October 2009 at 10:48. Written on 15 October 2009 at 04:26.